after learning that cartoonist Walt Kelly had already used it for a popular children’s book. And so, enlisting the services of eastern Pennsylvania’s Valley Forge Films — a religious short studio with little or no feature experience — and having no clue as to how the script’s many special effects could be created, Harris set out to make his dream picture. Included with the Valley Forge crew was director (and minister) Irvin Yeaworth, who turned out to have a great talent for making compelling cinema on a tight budget. After a stunning and unforgettable animated title sequence, set to a “Tequila” based rockin’ tune by a young Burt Bacharach, we tune in to the first kiss of teenagers Steve Andrews (Steven McQueen) and Jane Martin (Aneta Coursaut). Their hesitant make-out session is interrupted by a falling meteor. The pair decides to investigate the nearby crash. The rock comes down near the shack of an old hermit (silent film star Olin Howlin, in his last role), who investigates himself. He finds the meteorite, plus the rock’s weird inhabitant: a mass of living goo that attacks his hand and begins to absorb his flesh. Blind with pain, the old man stumbles in front of Steve’s convertible. The youngsters take him into town to see Dr. Hallen (Alden “Steven” Chase, president of the Screen Actor’s Guild at the time). Sending the kids off to look for the old man’s family, Hallen prepares to amputate the arm before the condition can spread. Too late though — the thing gobbles up the old man, the nurse, and Steve arrives back just in time to get a glimpse of Hallen becoming dessert. Of course, the kids tell the local police — who of course don’t believe them. Issues of trust are a major theme in the film, with a clear division shown between the war veteran adults and the baby boom teens. Finding no help from the authorities, Steve decides that the younger generation will have to do something about the menace themselves. Recruiting some buddies from a theater’s midnight spook — which is showing Daughter of Horror (flipped horizontally), a feature Harris was distributing at the time — Steve and Jane set out to rouse the community to the space age terror that’s just arrived in their back yard. For an independent production, Harris, cast and crew do a fine job. The cast was gathered from among the Valley Forge regular performers, the respected Hedgerow theater company, and some New York stage and television performers. McQueen was beginning to make a name for himself, but this was his first lead in a feature. Even though they were too old by a decade for their roles, McQueen and Coursaut manage to nail the discomfort, spirit and anxiety that comes with being a teenager. They manage not to look too out of place among Robert Fields (who played “bad boy” Tony Gressette) and his cohorts, who were actual teens at the time. The effects were achieved through a clever combination of manipulated silicone covered weather balloons and dyed silicone run through forced-perspective miniatures on a tilting tabletop. Some of them are surprisingly realistic, especially with the added sharpness of DVD. 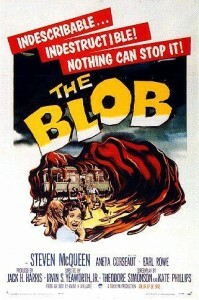 If you thought you should just pass on yet another video presentation of The Blob, think again. I’ve seen this picture in theaters, on TV, on tape, laserdisc, and even as part of a sculpture exhibit. Criterion’s new digital transfer is astonishing — easily twice as sharp as all previous presentations. Sound and image are both crisp and bright on a feature that has always looked and sounded murky. You can see the weave in clothing, dates on wall calendars, and even smoke from a cigarette that McQueen unsuccessfully tried to hide from the camera. For easy comparison, a blurry and brownish theatrical trailer provided on the disc looks exactly like the film has always looked before. Criterion’s menus are fun to just look through on their own, and lead to some nice extras. A “Blobabilia” section presents stills from the production, behind-the-scenes peeks, advertising materials, and even shots of what the miniature sets (and even the Blob itself) look like, all taken from the collection of one obsessed Blob fan. As a special bonus, they’ve also included a reproduction of the original theatrical poster folded into the package. The cover art — taken from the original poster art — is either printed too dark, or was designed that way to begin with. The title should have been emphasized better. However, it also retains the poster’s outrageous disclaimer. There are also two separate audio commentraks on the disc. The first, recording the rich baritone of Jack Harris, gives a thorough overview of how the production came to be, its immediate success at the box office (though originally bought by Paramount to fill out the bottom of a double bill with I Married A Monster from Outer Space, it became a hit on its own) and how it has fared since. Harris’ comments are intercut with those of film historian and Criterion regular Bruce Eder, who best makes the point that the independent production captured a part of American culture with which Hollywood was out of touch. On a second track, director Yeaworth talks about the film from his point of view, although I thought he could have gone into more detail about his own working methods. His track is shared by actor Robert Fields, who tells about becoming McQueen’s “little brother” on the set for a while. In all, this package gives you far more than even Criterion’s laserdisc edition of the title. This important pop culture icon has deserved this special treatment for a long time. This entry was posted in DVD, Movie, Review and tagged commentrak, DVD, giant monster, horror, Irvin Yeaworth, meteor, monster, sci-fi, Steve McQueen. Bookmark the permalink. This is the movie that got me started on horror films when I saw it back in 1966 when I was 4. I have this Criterion version and a lot of Blob memorabilia. Thanks for the article.